An evening at the Hard Rock Cafe at Yonge Dundas Square seen along Yonge Street in downtown Toronto, Ontario, Canada. 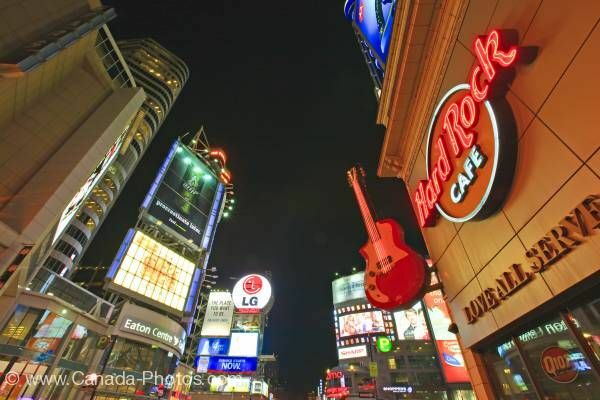 Nightlife of Yonge Street shows the stores display their lighted signs such as the Hard Rock Cafe and its large guitar mounted to the side of the building. Bright lights and signs are displayed on the many buildings with the starless dark sky as its backdrop. Eaton Centre and Yonge Dundas Square seen along Yonge Street in downtown Toronto at night, Ontario, Canada.